People Soup by Ross McIntosh: What are you two clucking about? Ross presents some evidence on gender differences in organisations. Amongst other findings he covers 'Think Manager Think Male' and the glass cliff (where women can be put in precarious leadership positions). Drawing upon a Harvard Business Review he agrees that the route to leadership for women and other minorities is more labyrinthine than a ceiling. He finishes with a paper that suggests it's time to introduce positive discrimination to accelerate gender equality. The take away is a clarion call - to flag micro-behaviours - both good and bad. Below - the live studio audience for this episode. 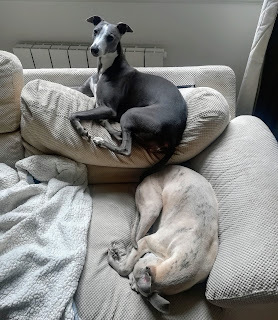 Seems appropriate that Fiona was on the top cushion! The shackled runner: time to rethink positive discrimination?